PRODUCT: SQUEEGEE, 18" SERRATED 3/16" (V-notched) GRAY EPDM RUBBER. REPLACEABLE BLADE SET IN HEAVY DUTY STEEL FRAME. PRICE/EACH. SQUEEGEE REPLACEMENT BLADE, 18 WIDE x 1/4 INCH SERRATED EDGE, GRAY EPDM RUBBER REPLACEMENT SQUEEGEE BLADE. PRICE/EACH. SQUEEGEE REPLACEMENT BLADE, 18 WIDE x 1/8 INCH SERRATED EDGE, GRAY EPDM RUBBER REPLACEMENT SQUEEGEE BLADES. PRICE/EACH. 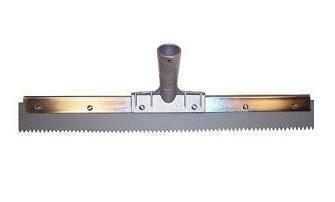 18 x 3/16 Inch SERRATED EDGE, GRAY EPDM RUBBER REPLACEMENT SQUEEGEE BLADE. Fits most popular squeegee heads. PRICE/EACH.